REMINDER -- You can install the update before it goes into effect. No need to wait until the last minute! A new Nags release goes into effect on Monday January 14th, 2019. IBS has created a direct link to the update file. Please click this link to gain access to the download. Install this update AS SOON AS POSSIBLE! There is no reason to wait to install NAGS Updates -- Elmo will automatically start using the new pricing on the correct date. Installing early gives you access to the new vehicles and pricing before the price changes go into effect. If you are using our new Elmo Anywhere software, your software is already updated! If you'd like to learn more about our new software, head over to https://signup.elmoanywhere.com and let us know if we can answer any questions for you. We are in the beginning stages of on-boarding existing Elmo32 customers, so there might be a wait to be converted to the new software. Click on the Nags Update Download Link above. Please notice the location that the file is being saved to. The update must be run on each computer, so you may want to save it to your shared Elmo directory so each computer can access it. Make sure you run the update one computer at a time and Elmo is closed on all computers. Once the file has downloaded successfully, please navigate to where the file was saved using Windows Explorer, and double-click on the 01142019Update.exe to install the update. If you receive the error message "The file 'C:\\WINDOWS.\system32\isr.dll' could not be opened. please check that your disk is not full and that you have access to the destination directory." You will need to run the update file as administrator. To do that, right-click your mouse on the update file, then choose Run as administrator. 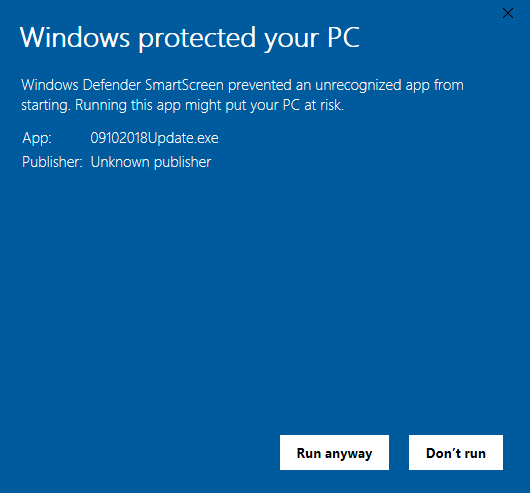 Microsoft Windows Defender might pull up the message below and prevent you from running the update. If this happens just click More Info, then click Run Anyway.